I’m Alison, Founder of Iron Maiden Fitness. And my passion is helping women be strong and confident so that they can live their best lives. This is important to me because for a long time I was caught up in insecurities and fear – definitely not being the best version of myself. And much of why that was stemmed from body image issues. Getting stronger and healthier was the catalyst for some big life changes, which is what ultimately led me to help my Iron Maidens do the same. When I was a child, I identified as the chunky girl. I had muscular legs and was always looking down at them and wishing they were skinny like some other girls I’d see – never realizing or appreciating how amazing it is to have a strong athletic body. I legitimately thought over and over for many years that getting to my ideal body weight would have some magical effect on my happiness and life would literally be perfect. As you can imagine, this led to a hyper-focus over my body as I got older. Being thin became an obsession. I remember a period in high school when I restricted myself to 800 calories a day, and food consumption became the one thing I felt I could truly control in my life. I spent hours, days, weeks and months obsessing over every bite of food, until one day, I “slipped” and ate a brownie at a school function. I was so distraught that I drove home and made myself throw up. This pattern continued for a while. I’d try to be “good” on my highly restrictive diet, but when I “slipped” I’d find my way to the restroom and “take care of it.” I eventually reached a point where the stress of this lifestyle and obsessing over food and exercise consumed me – and I was depressed. I came clean about my eating habits to my family and began therapy. Thanks to my therapist and the support of my family, I found my way back to a healthy relationship with food, but getting to a consistently healthy place took time. It actually wasn’t until much later in my adult life that I truly became at peace with it all. During my childhood and adult life, I was always active and loved sports and fitness. I played lots of soccer growing up and when I got to college, I would run and do step aerobics (yes, step aerobics was a big thing in the 90’s!) In my 20’s, I was a cardio queen on the Eliptical trainer, and then later got really into hot yoga. I never did weight training because I had this idea in my head that I was already really muscular, and it would only make me bigger. One day, well into my 30’s, I was approached by a trainer at the gym who offered me a free session. I shared with her my concern that weight training would make me bigger. This trainer looked me in the eye and told me not to be afraid. She was strong, feminine and beautiful, and something told me to listen to her. Sooooo glad I did! I never realized how much I was spinning my wheels with cardio until I added a few days of weights to my routine. My body became leaner, more defined and I felt amazing! Now during this time, I was reconsidering whether my corporate job was really fulfilling me. I worked at a big tech company, and while I loved the people I worked with, I just wasn’t that passionate about technology. I tried to focus on the things I liked about my job, but I knew deep down that I would never be fulfilled with my work there. When I had my second child, I took a risky step and said goodbye to my 13 years at the company, so I could be a stay-at-home mom. It was a risk that paid off. While staying home with my second son, I began taking stroller classes so that I could work out without putting him in gym daycare. I had a lot of drive in those classes and took the fitness aspect quite seriously! Pretty soon I was invited to start teaching the classes. What a thrill it was to finally feel a passion for my work! I felt like I was on to something, and found myself eager to learn more about fitness, so I enrolled myself in a course to become a Certified Personal Trainer (CPT) through the National Academy of Sports Medicine. While I was taking my CPT course, I also began physical therapy to address some back pain that had been slowly getting worse over the years. I really thought I was in amazing shape at this time, but was humbled by the fact that some of the muscles in my abdomen had become so weak, I could barely activate them! My therapist would tell me to “scoop your lower abs up and in”, and I would literally hold my breath and tense every muscle in my body except my lower abs! But when you really think about it, after two C-sections and those muscles literally being cut with a scalpel – twice – it makes sense that they would need a little physical therapy to find themselves again. As my core got stronger and I progressed in my therapy, not only did my pain disappear, but I could feel how much stronger and more stable I felt all the time – whether I was picking up my son, training at the gym or just doing things around the house, I felt super solid in my core. Now I admit, most people don’t get excited over this sort of thing, but because I was already diving deeper into my training education, I totally geeked out and tried to understand every aspect of my therapy so that I could share this with my clients. And it made me uber passionate about helping women build their core strength. In fact every Iron Maidens class starts with a thorough core warmup to prepare our bodies for the workout – because having a strong core is the starting point for strengthening the rest of your body. Now let’s fast forward to Summer of 2017. 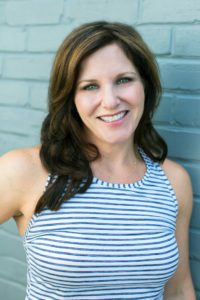 I had my personal training certification and was trying to figure out the best way for this stay-at-home mom to further her fitness career but still enjoy those last few years of toddlerhood with her kiddo. I reached out to a few girlfriends to try and get a summer Bootcamp going and got a great response. 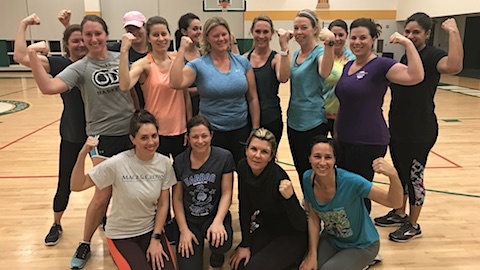 At the time, I thought that this would be a way to ease into 1:1 training, but my clients seemed to really love the group training, and my class sizes were growing bigger from referrals. It started to feel like the Universe was pulling me in a different direction and I needed to let it take me there. And that is how Iron Maidens came to life. So how has fitness enabled me to live my best life? Well, learning how to train my body safely and effectively has no doubt transformed my exterior. But being confident on the exterior has opened the door for me in so many other ways. It’s given me the awareness to establish healthy habits. It’s given me the freedom to do physically and mentally challenging things. It’s given me the courage to follow my passion. In essence, a healthy lifestyle is the baseline for so many amazing things. It can do all these things – and more – for you if you want it to. And I’m here to help you do it!